China's stock market fell Monday by its biggest margin in eight years, defying the government's multibillion-dollar attempt to stop a slide that has wiped out all of the gains of this year's price boom. 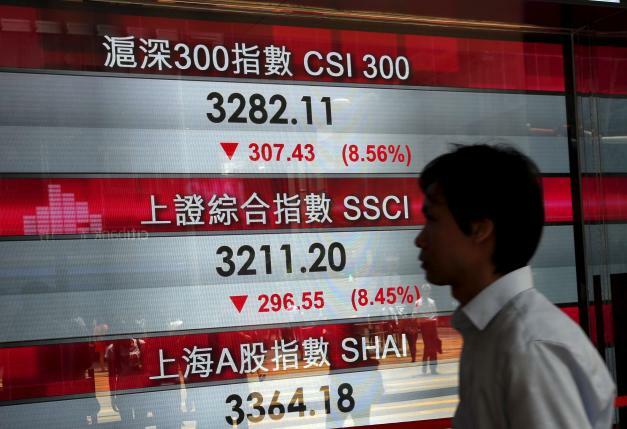 The decline threatened to weigh anew on global markets after last week's Chinese losses triggered a worldwide selloff. 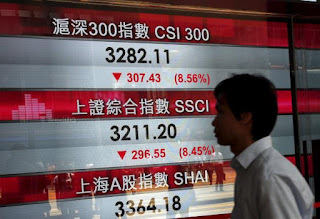 The benchmark Shanghai Composite Index fell 8.5 percent to close at 3,209.91 points, its biggest one-day loss since an 8.8 percent decline on Feb. 27, 2007. The index is down 38 percent from its June 12 peak and just under 1 percent below its closing on Dec. 31, last year's final trading day. The slump has inflicted heavy losses on small investors, souring many on stock ownership and threatening to disrupt Communist Party plans to use the market to raise money for reforms of state industry. "It feels like the end of the world," said Pan Chong, a social media specialist. He said he invested 50,000 yuan ($7,900) in April, made 40 percent and then saw the market wipe out those gains. "The so-called correction will finally become a long-term bear market," said Pan, 25. "So I'm considering selling all my shares as soon as possible." The Chinese benchmark soared more than 150 percent starting in late 2014 after state media said shares were inexpensive, which led investors to believe Beijing would shore up prices if needed. Urged on by state media, millions of novice investors rushed into the market. Prices faltered and then plunged after an unrelated change in banking regulations in June led investors to question whether Beijing's support might be weakening. The market index fell 30 percent, prompting Beijing to intervene by barring big shareholders from selling and promising state-owned brokerages and pension funds would buy. Beijing's initiatives helped to calm markets. But after the state-owned company charged with buying shares to prop up prices announced it would not intervene every day, the Shanghai index fell 11.5 percent last week. The declines come at a time when exports, manufacturing and other Chinese industries are weakening, leaving little economic foundation for higher share prices. The latest fall probably was triggered by poor performance at publicly traded companies, said Guo Tianyong, a professor at the Central University of Finance and Economics in Beijing. The government reported last week that profits at state-owned companies contracted by 2.3 percent in July from a year ago, compared with a 0.1 percent contraction through June. "We shouldn't doubt the government's ability to rescue the market. If they want, they could push up the stock index to 5,000, but it is not necessary for the government to play an excessive role," said Guo. "It still would be better for the market itself to play its role." Beijing's surprise Aug. 11 devaluation of its yuan added to investor jitters. They worry the change will lead to money flowing out of China, reducing credit available for trading. The central bank has responded by pumping extra money into credit markets. The ruling party wants to use the markets to raise money for state companies to reduce debt loads and modernize. The party also wants to encourage stock ownership as a way for families to save for retirement, reducing demand for social spending. But small investors whose holdings have plunged in value say they will no longer buy shares. Lu Zhen, 29, an employee at a financial firm, said the value of his shares rose by 250,000 yuan ($40,000) over the first half of the year. But he said since the June downturn, he has lost that and an additional 150,000 yuan ($24,000). "This is definitely the end of a bull market," Lu said.